Two years ago, I had a feature on the blog called "Rochester's Best Cupcake." I reviewed several cupcakes and crowned Heather Saffer's Bananas Foster cupcakes from The Cupcake Dreamery the very best in town. 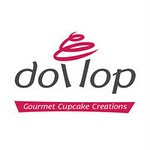 Heather opened her new cupcake bar, Dollop, in the summer of 2011 and will be on this Sunday's "Cupcake Wars" on the Food Network. I have known Heather now for nearly 2 years and am really happy that my blog's cupcake contest allowed me to also make a friend. I'm so excited to go to Heather's viewing party Sunday night. The episode airs at 8pm EST on Food Network. Heather will be one of 4 bakers competing for the $10,000 prize that the winner of "Cupcake Wars" will take home. Please watch Sunday night!